SOUTH AFRICA’S YOUTH are experiencing an economic disconnect. A generation faced with a world without jobs, a massive debt burden, and an economy that has failed miserably to gear itself up for the third-wave technologies that Asia and the West have embraced decades previously. Successive waves of innovation have seen — the virtualisation of the economy, the dematerialisation of assets and the Internet’s proverbial death-of-distance. Pop-up factories, makerspaces, friction-free digital copies and the ‘Internet of Things’ are all buzzwords and terms which the youth are invariably going to meet on their free education journey. In the future, your neighbour will hand you a copy of an open source motorcycle, just so the two of you can go for drive. When you return, you will recycle the vehicle into any number of other open source devices. We are rapidly approaching an era in which robots self-assemble and produce the goods, which we buy with our wages, which are in turn given to us, via a more efficient means of production and redistribution of wealth. This is an alluring proposition. Holland for instance had moved to end labour in mining. Machines are replacing humans wherever they are found, and the full automation of society is only a matter of time. Although the country is one of the few nations on the continent to have implemented a social security programme, this programme is geared towards the elderly, disabled and child-care grants. Thus the youth of today, are born into social security — their parents are recipients of state welfare not because they are citizens, but because they have children. Once a child is over the age of 18, this grant falls away. The double-whammy of unemployment and poverty kicks in. Some 25.5 percent of the population is unemployed and this figure is worse when the youth and first-time job-seekers are concerned, rising to 63%. So far as social security in South Africa is concerned, we are a nation which has the cart before the horse. Instead of paying families to have children, we should be paying people to stop working. South Africa’s youth can work and play, just about anywhere there is an Internet connection or icafe, but getting connected to the Net is not sufficient to enable jobs and free education. There are other necessities, common to first world economies which we lack as a nation, and without them, being merely connected, is simply not good enough. In fact, a job, as an end in itself, may not necessarily be all that desirable, the same way that owning anything in an economy based upon abundance, is not the alpha and omega. Exactly how is the country to going pay for free education, and range of services? How are we all going to live in a world without jobs? These are the questions foremost on people’s minds, as the country sobers up to the events of the past weeks, which saw the unprecedented storming of parliament and storming of the Union Buildings. South Africa as luck would have it, already has a ‘sovereign wealth fund’ with a massive R1.5 trillion rand invested, and certainly the youth need to be tackling finance minister Nhlanhla Nene and education minister, Blade Nzimande on why they are suffering in the face of so much wealth. Instead of a Public Investment Corporation (PIC), benefiting one privileged generation who just happened to be in power during the 90s, let’s make the public investment more inclusive of all citizens, and all generations, and recommit the fund to its Public goals, since the ruling party appears to have lost the distinction between what is public and what is private, funding Nkandla, and government pensions for party insiders. PIC should rather be redirected to funding a social wage for all citizens, one which includes free education, health insurance and a basic income grant. Instead of a party wage, we could have a social wage reducing the worst affects of poverty and mitigating the coercion inherent to the job market, even one that is Internet-enabled, while providing free education. Moving South Africa from a coercive labour market to a voluntary labour market, could easily be achieved by removing the compulsion, violence and necessity to seek employment. A job should not be a requirement in order to survive or be a South African citizen. Labour should never be compulsory, or forced under the barrel of a gun. As Marikana has proven, people are willing to die for their freedom, and this message is now being taken up by students, who rightfully are demanding free education. The same generation will soon be demanding social security, a social wage for life. SWISS residents will soon vote on an initiative that would guarantee a basic monthly income of 2,500 Swiss franks ($2,800 pm or $33,6k/yr) for all working adults in the country to combat income inequality across the nation. The initiative collected the 100,000 signatures needed for a referendum on the proposal, and to mark this historic initiative, a truck in the city of Bern unloaded 8 million five-cent coins, on Friday to represent Switzerland’s 8 million citizens. The parliamentary vote has not yet been scheduled, but it could take place before the end of the year. 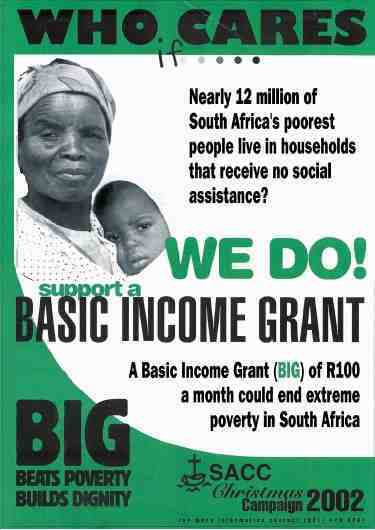 This proposal is reigniting South Africa’s own Basic Income Grant (BIG) proposals. If you remember, opposition parties and civil society groups called for a BIG in a campaign that appears to have been put on the back burner because of concerns over the tax burden. With elections coming up in 2014 and calls by far-left groups to end private ownership of property, the time for resurrecting the BIG is now. As a stop-gap measure, medialternatives has suggested an annual or bi-annual benefit based upon a co-ownership model in which citizens take ownership of the sovereign wealth of the country, receiving dividends like any normal shareholder. South Africa can definitely afford to pay its citizens an annual benefit, since it has 80% of the world’s platinum supply and 50% of the gold reserves, more mineral wealth than is sitting in the bank vaults of Switzerland. A guaranteed monthly income is not out of the bounds of possibility and would not necessarily impact on the tax burden, since it could be drawn from direct investment in the economy. Instead of allowing wealth to flow out of the country or into the pockets of the politically connected, South Africans can act to force our government to take a more active role in seeing to the needs of its people. Co-ownership benefits and a BIG could be the impetus needed, since the country is confronted with a similar dilemma as any oil-rich nation facing potential ruin when the oil runs dry. Industry pundits have placed the actual working life of the countries gold mines at no more than another 10-15 years — the cost of getting the ore out of the ground is becoming too expensive, as these reserves are depleted forcing miners to dig deeper. Diversification of the development of our country for the benefit of future generations — growing the sovereign wealth of the country so that all may benefit — could be the solution. The country has a window of opportunity to reap rewards from its global investments over the past decade and to repatriate these profits in the form of a BIG or a Citizen Co-ownership Benefit. With the JSE becoming a hub of international commerce, public investments are already showing sign of a pay off as our mineral wealth is diversified into global commerce, time to remind the politicians that these investments are meant to benefit all citizens not simply politicians. BIG: We want wealth redistribution now, not poverty alleviation sometime in the future! OPPOSITION to a basic income grant (BIG) falls into two categories — there are the free marketeers who preach an extreme form of market fascism in which economic losers need to be punished in order for the system to sustain itself, along with the exploitation of labour for profit, and for whom welfare is anathema (since it would mean relief from the punishment “incentive” and dilution of the motive forces behind capitalist competition), then there are the market liberals like Sean Archer (Cape Times Oct 24) who puzzle themselves with theories that merely restate the problem of poverty in terms of pseudo-scientific empiricism. How much will poverty alleviation cost? How many poor are there in South Africa, and how can we distinguish between the poorest of the poor and the not-so-poor? Questions like these trouble the minds of liberals who have never experienced poverty, or who fear that tackling this issue will erode their status and position in society, effectively overturning the apple-cart as it were. The definition of what it means to be poor, as Archer intimates, must inevitably be rewritten by a form of redistribution that tackles the harshest of economic cruelties and depredations.